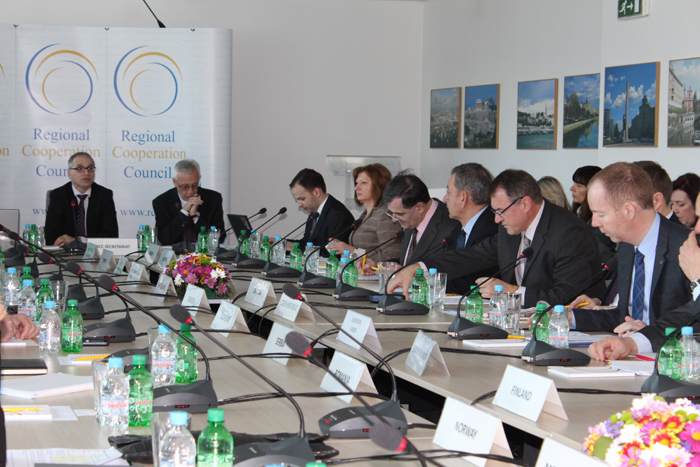 At its first meeting in 2013, the Regional Cooperation Council (RCC) Board decided to amend the statute and the list of participants of the organization, reflecting the results of the EU-mediated dialogue between Belgrade and Prishtina. “The participation of Kosovo* in the Regional Cooperation Council is a confirmation of the organization’s full dedication to ensuring all-inclusiveness in our activities. It shows that the region is able to take responsibility for its own future and create conditions for overall progress in the spirit of tolerance and cooperation”, said Goran Svilanovic, RCC Secretary General, following the decision. The RCC Board also discussed the draft RCC Strategy and Work Programme 2014-2016, and heard a report by Secretary General on activities of the organization’s Secretariat in the period October 2012-February 2013, as well as information on future plans. The Board was informed about the 11th Coordination Meeting between the SEECP Troika (Serbia, The Former Yugoslav Republic of Macedonia and Romania), the RCC Secretariat and the European Union, held yesterday. The Board members congratulated Secretary General Svilanovic on the assumption of duties on 1 January 2013.